Saint Tryphon was born in Lampsakos, in Phrygia during the reign of the Emperor Gordian. From a young age, his task was to be a goose-herd. The ignominy of his work, however, did not deprive him of, but actually increased his spiritual knowledge through his exalting humility and his overwhelming love for Christ. Even as a young man he was able to perform wonderful things. Among many other things, he cured the daughter of Emperor Gordian, who was tormented by an evil spirit. Indeed, he not only expelled it from the young girl, but, by the grace of Christ, forced it to appear before them in the form of a wild dog. As a result of this, many people embraced Christianity. Later he was brought before Acylinus, the eparch of the East, and confessed his faith before him and received the stigmata of Christ on his body. He withstood a great many tortures. They struck him with wooden swords, tied him to wild horses and dragged him over rough ground. They also burned his sides with lighted candles. In the end, he was beheaded and entered the heavenly dwelling-places wearing a crown. 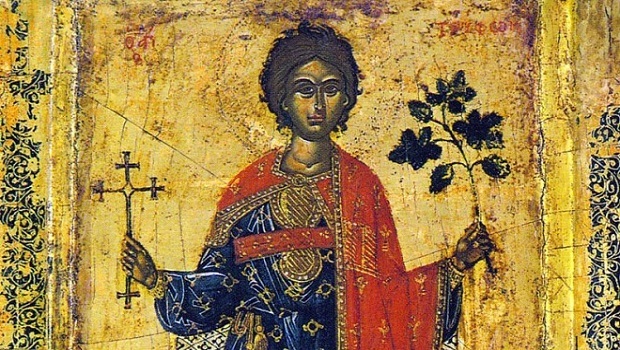 Saint Tryphon is the patron saint of gardeners and farmers.